I love Youtube and I believe many people love it too. Many people like to embed the Youtube video into their websites or blogs so they can write something about the video and share with friends. Sometimes, after I have clicked the play button on the embedded video in somebody’s blog but I would like to stop it because I found that the video is not interested to me at all. I can only pause the video and I can’t stop it from loading data from Internet because there is no stop button at the embed video. At the same time, I also feel don’t want to leave the page because I haven’t finished reading the post content or comments left on the page. But to stop the video from loading, I have to navigate to other page and back to the page again. It’s quite useful to have a stop button at the video because I don’t want the Youtube application to keep consuming my network’s bandwidth (which is pretty slow in my country). A typical video can have size from a few mega bytes to hundreds of mega bytes. To solve the problem, I found a really simple trick to stop the Youtube video from loading in Google Chrome browser. I’m not sure whether you can perform it on other browser or not. Google Chrome runs plug-in in other process. A Youtube video is a Shockwave application which is a plug-in to Google Chrome browser. So to stop the video from loading, you simply kill the Shockwave plug-in process. Please note that killing the process may cause applications (e.g. flash animation) at other tabs in Google Chrome browse not working. To kill the process, right click on Google Chrome at your windows task bar (or right click Google Chrome Windows’ title) and select “Task manager”. 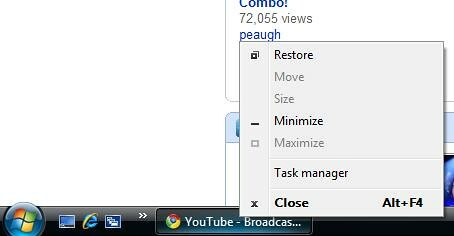 This is the task manager for Google Chrome only and not for the whole Windows Operating System. After that find the process with name “Plug-in: Shockwave Flash” and click on it. Then click “End process” button to end the process. To reload the video again, simply refresh the page. Again, please note that killing the process may cause plug-ins / applications (e.g. flash animation) at other tabs in Google Chrome browse not working. Thanks a lot! It’s awesome! BTW you can download the stopped video using GetYouTube plugin for Google Chrome.